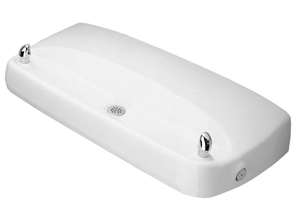 White enameled iron, barrier-free two bubbler commercial drinking fountain uses patented stainless steel push-button valve assembly which allows front access stream adjustment as well as cartridge and strainer access. Dual bubbler heads locked to main bowl prevent against vandals and provide efficient water flow for twice the users as single bubbler fountains. Polished Chrome-Plated Brass Bubbler Head and Waste Strainer. Provision for Trap (not included) Must Be Made in or Behind Wall. Low profile wall mounted design makes this fountain an ideal choice for places with limited excess space. White enameled iron provides unbeatable durability. Soft rounded corners prevent mishaps once the fountain is installed. Model 1341 Series meets current Federal Regulations for the disabled including those in the Americans with Disabilities Act. Haws manufactures drinking fountains, electric water coolers and electric drinking fountains to be lead-free by all known definitions including ANSI/NSF Standard 61, Section 9, California Proposition 65 and the Federal Safe Drinking Water Act.